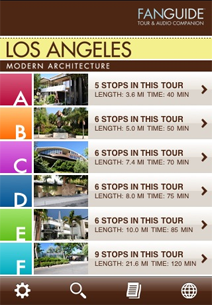 useful for fans of architecture and self guided walking/driving tours. selected the Los Angeles one as it has stunning modern architecture in the city. my favorites is the Neutra House! interface is pretty slick, colorful, and easy to use. def would rec this for anyone traveling who wants a proper architectural exploration of any of the other cities they have tours apps for.